Apple season might be the obvious time to bake with apples, but there's no reason to wait until fall. Fresh, crisp apples are available in supermarkets year-round, so why put off making this amazing gooey caramel apple cake? This easy one-layer cake is moist and perfectly spiced, and it contains a full 2 cups of chopped apples. But the thing that elevates this cake is the hot caramel topping. 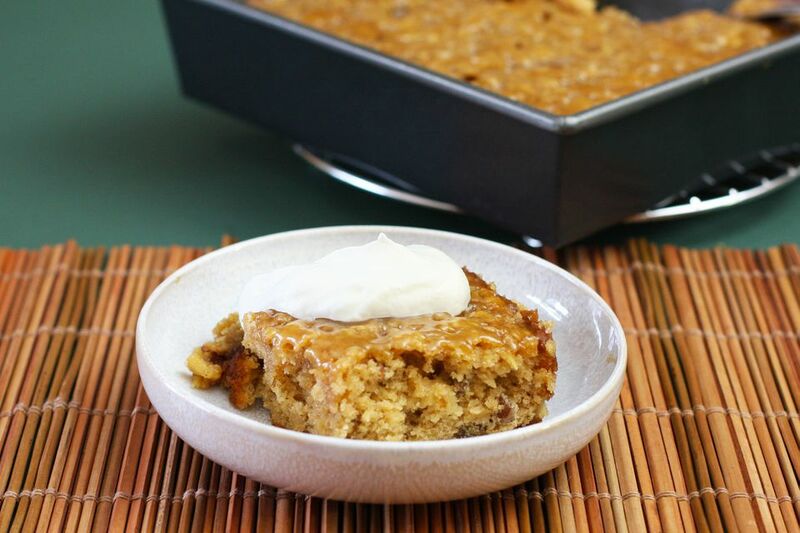 The topping is a simple boiled combination of butter, brown sugar, and cream, flavored with a splash of pure vanilla extract. Different varieties of apples have different characteristics. Some are better for baking, some are better for eating, some stay firm when cooked, and some break down. Granny Smith, Honeycrisp, Gala, Fuji, and Jonathan or Jonagold are all excellent baking apples. In a bowl, combine the flour, baking powder, and salt; stir with a spoon or wire whisk and set aside. In a mixing bowl with an electric mixer, beat together 1 cup of brown sugar, the vegetable oil, cinnamon, and 1 tablespoon of vanilla. Add the eggs, one at a time, beating well after each addition. Add the milk and beat until the batter is smooth. To the batter, add the dry ingredients and stir just until blended. Fold the chopped apples into the batter. Bake the apple cake in the preheated oven until it is firm and springs back when touched lightly in the center with a finger, or about 30 to 40 minutes. Meanwhile, make the caramel topping. In a heavy saucepan, combine the 1/2 cup of brown sugar, 1/4 cup of butter, and the heavy cream. Place the pan over medium heat and bring to a boil. Reduce the heat to low to maintain a simmer; continue cooking, stirring frequently, for 5 minutes. Remove the sauce from the heat and stir in 1 teaspoon vanilla. With a fork, pierce the hot cake all over. Pour the hot caramel topping over the cake. Serve the cake warm or at room temperature with a dollop of sweetened whipped cream or whipped topping. Alternatively, serve with a scoop of ice cream. Store leftover cake well-wrapped or in an airtight container for about 2 to 3 days at room temperature or up to 4 to 5 days in the refrigerator. Make sure to choose a neutral flavored oil for the cake, such as canola oil, grapeseed oil, or plain vegetable oil. Avoid oils that alter the flavor of the cake, such as olive oil or coconut oil.